AiClay - a Haven of Miniature Food: Pretty packaging & le winner! So firstly, thank you all for participating in the Gold Coast Giveaway! I was lol-ing through out all your creative ways to crack the macadamia nuts. If you need a laugh, please head to the comments section of the previous post! Since the number of participants was quite small this time round, I allowed myself the luxury of doing a lucky draw the traditional way. Jack saw me cutting out the little slips of paper, and his jaw dropped and he went, "OMGWTFBBQ are you doing??" Okay, I might have exaggerated. But he thought I was crazy for 'wasting my time' on that, when there were online tools like random number generators. I'm also sending the gifts in this Cath Kidston gift bag. P.S those polkadot sheets are actually tablemats, and they were a spontaneous buy at Daiso (where everything is at $2!). But my family doesn't use table mats so I decided to use them for photoshoots instead. 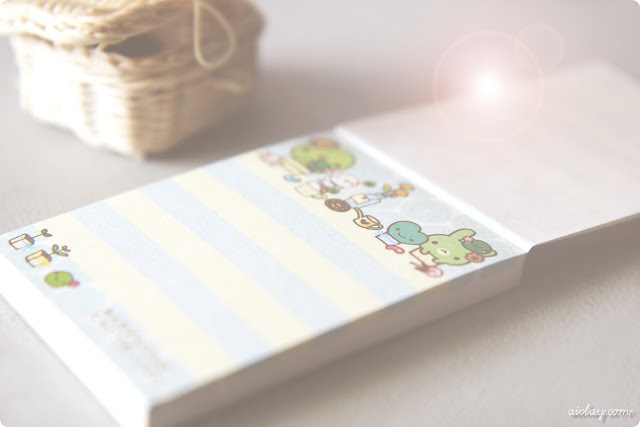 Finally, just to share my adorable notepad where I write little notes to my customers. Look at that heart cactus! and the heart teapot! Awww. Hope you have a productive Thursday!